Sea & Reef Aquaculture announced the release of their new PNG-lineage “Morse Code” Maroon Clownfish, Premnas biaculeatus. Lovers of the Lightning Maroon Clownfish, or for that matter any of the unusual Maroon Clownfish that came out of Papua New Guinea (PNG), will recognize these distinctive looking Maroon Clownfish. There’s more to the story of course. Breeders who are actively pursuing Lightning Maroon breeding projects will see what I see – for the moment, this new lineage of PNG Maroon Clownfish provide an exceptional outcross opportunity for other PNG Maroon Clown breeding efforts (being the offspring of wild parents, these Sea & Reef Morse Code Maroons are F1). It’s important to remember that with a new form of fish being brought into cultivation, genetic management and the size of the foundation population really does matter. While the Sea & Reef Morse Code Maroons are pretty attractive in their own rights, there’s extra value in the genetic diversity they bring to the PNG-lineage Maroon Clownfish that will fill the market in the years ahead. For those who believe that the white-stripe offspring of the original Lightning Maroon Clownfish may hold a hidden recessive “lightning” gene, the “Morse Code” offspring from that pairing may still be preferential as mates with each other or their “Lightning” siblings. However, as the breeder in that project, I am compelled to once again state that I don’t believe the white stripes out of my own breeding hold any secret “lightning” genetics. Therefore, even I look at Sea & Reef’s Morse Code Maroons as ideal outcross mates for the fish I produce. They will remain the best and only choice for outcrossing until my own F0 pairing starts producing unrelated white stripes and/or “Morse Codes” (or a third party arrives on the scene with the same, or PNG starts exporting wild maroons again). 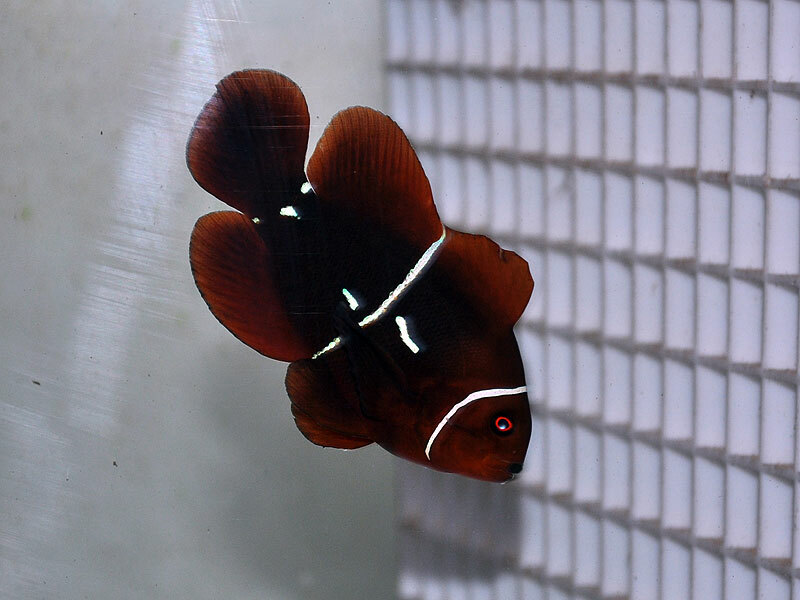 The original wild PNG Maroon Clownfish we dubbed the Morse Code Maroon. This fish is not directly related to Sea & Reef’s offerings, but is the namesake / origin of “Morse Code” as the phenotype name. Image by Matt Pedersen / The Lightning Project. When it comes to the name game, I take a bit of a compliment in Hansen’s use of the name “Morse Code”; the name I initially applied to a wild PNG Maroon which had spots and barrings. Wild fish of this type have been exported under all sorts of different names (horned, spotted, unique). It would seem between my own production of these phenotypes as offspring of the Lightning Maroon pairing, and now Soren’s production of these from another unrelated white stripe pairing, there is something to this, and we probably should use a name that’s consistent. Given the similarities (or “sameness”) of these fish, even I will probably start referring to all these fish as “Morse Code” Maroons, reserving “white stripe” only for those fish which show the classic 3 stripe pattern. And of course, the PNG provenance is very important to keep clean with this line of breeding too. WS12 – the fish mentioned by name by Soren. 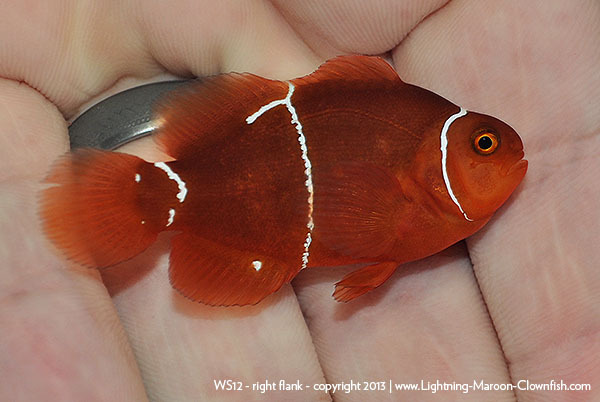 A F1 PNG Maroon Clownfish from the Lightning pairing, showing the same “Morse Code” phenotype. Clearly, there is something special about PNG Maroons, and name consistency is important. Worst case scenario, “Morse Code” isn’t a genetic trait, and “Morse Code” could simply be environmentally caused, on par with “Misbars”. Either way the name accurately describes a phenotype prevalent in these Maroon Clownfish from a particular geographic location, just like “Gold Flake” does for the Gold Stripe Maroons with similar over-patterning. Now that we have more than one source for this phenotype, it’s time to be consistent on the name. Going with the naming conventions I proposed at MACNA 2012, the full names for these fish would be Premnas biaculeatus “S&R Morse Code PNG” F1 ; the offspring of my breeding would be something like P. biaculeatus “MW Morse Code PNG” F1 (“Lightning PNG” F0 X “White Stripe PNG” Fo, Pair 1), using the parenthetical addition to denote additional information about the lineage/breeding beyond what you’d see in the overall name. This naming model fits well with the existing industry tendencies, as well as also following the prexisting conventions used in freshwater fish breeding and beyond. Does this naming technicality or genetic mystery matter to the casual consumer? Absolutely not! But it does matter to serious breeders if we hope to elevate and standardize what we do (which only helps us all!). I think it’s fair to say that we don’t know the genetics behind this spotting and barring, but as ORA has discovered, the random “GoldFlakes” that were once thought to be environmentally-caused are probably genetic, and so too, there may be a genetic mystery to unravel here within the PNG white stripe population. We well could be looking at the “exact same mutation” as “Goldflake”, but showing up on the thinner bars of White Stripe Maroons, and thus calling it “Morse Code” instead of “White Flake”. This use of a different trait name is entirely acceptable in my eyes, given that some folks believe Gold Stripes and White Stripes are not the same species (for numerous reasons) – Wyoming Whites and Platinum percs are basically the same mutation, but in different species. Could breeding with Morse Code Maroons from PNG lead to solid white Maroons just as ORA’s breeding with “Gold Flakes” led to the solid flanked “Gold Nugget”? Quite possibly, and ORA possibly shows their cards when they write “[Gold Nugget’s] unique appearance is the result of a genetic mutation that manifests in a similar way to the mutation that produces the Platinum Percula.” (on the Gold Nugget Product Page) If you understand the genetics that make up Platinums, there’s a TON you can read into ORA’s causal genetic reference. Could there in fact be more than one genetic mutation running around in the populations of PNG White Stripe Maroons, both a Morse Code gene and a Lightning Gene? Could it even be that the reason the young Lightnings don’t look quite like Mom might be because the original Lightning could be the product of two genes and not one? Maybe a morse code and lightning gene, even on the same locus, the Lightning giving half her babies a Lightning Gene and the other half the much less apparent Morse Code Gene? Could we someday soon have “Platinum” Maroons out of Morse Code Maroons? Could there be some other genetic interplays we have yet to see and understand within these PNG lineage fish? It’s all absolutely pure speculation at the moment, but Sea & Reef’s independent production of “Morse Code” Maroons smacks of genetics, heritability, and another new designer playground being opened up. That said, careful breeding and record keeping, and the open sharing of information, will certainly illuminate the genetics with enough time. Sea & Reef has provided a valuable new genetic tool to further our investigation. And even if you don’t intend to ever breed a clownfish of any type, much less PNG Maroons, these fish are are still quite visually interesting. While we may lump them into the “designer” category (and they are “designers” as we’ve come to think of them), I must again reaffirm that these are not hybrids, nor did they “originate” in someone’s tanks, they are in fact part of the natural biodiversity of this species in PNG. The benefits of this likely being simply a genetic trait (and not a cross-species hybrid in origin) is that it can just as easily be “bred out”…there’s no reason to think that you cannot get back to the default 3-barred Maroon out of these bloodlines, and there’s no reason the PNG provenance can’t be kept pure within this captive population of Premnas biaculeatus. If anything, Sea & Reef’s revelation bolsters the notion that PNG Maroons are indeed quite special, and are worthy of keeping pure (in the hopes that we can unlock even more secrets from them). Special thanks to Soren for sharing these images, and for taking the time to answer our questions on this exciting development. Check out the new Morse Code Maroon Clownfish product page on Sea & Reef Aquaculture’s website for more information. I may share further information and insights as they become available over on The Lightning Project. ORA Breaks the Blenny Barrier - Captive-Bred Red Sea Mimic Blennies!